Frank Lehmann is a lifelong collector. 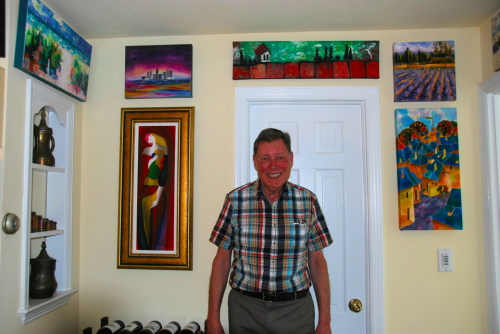 Five years retired from his career as an international banker – 43 years spanned across London, Kuwait, San Francisco and New York City – Frank is enjoying his golden years with his wife and ever-growing art collection in their Centerport, Long Island home. 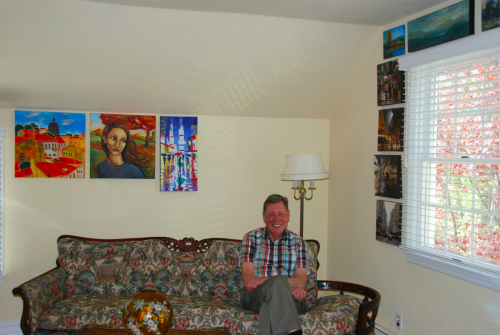 In his sweet demeanor, Frank recalls his collecting journey and how a cruise vacation inspired him to fill the walls of his art room end-to-end with artwork. When did you begin collecting art? While living in London during the late 1960s and early 1970s, I collected a number of 19th century English oil paintings for investment purposes. I became a devout anglophile and also accumulated old leather bound books and assorted Royal Family memorabilia. Then came a 45 year period devoid of art, but full of collectibles. I became an obsessive collector, accumulating all sorts of “stuff” including old toy trains, coins, old radios and phonographs, books, antiques, maps and yes, baseball cards – you name it and I would collect it. I thought everything would become a great investment in time. Unfortunately, that time never happened as eBay ruined it for me. What I thought was rare was soon readily available on the internet as collectors/investors like me emptied out their attics and basement to cash in on what they thought would be high selling prices. Values declined rapidly and as I entered my 60+ golden years I began the arduous task of disposing of my former treasures online, in the media and with charities. From then on in all I wanted to collect and use were things that I could smoke, eat or drink [laughs]. What brought you back to art? As I entered my 70s, my wife and I decided to renovate a few rooms in our house including a large den that housed some old furniture, an outdated TV and unused old kitchenette that came with the house. The room would become mine to remake. I cleaned it out, removed the kitchenette and furniture, had it painted and refinished the floors. Lo and behold it would become my “art room”. Why? This was towards the end of 2014 and my re-found interest in art started during one of those cruises we happened to take that had an art auction aboard. On the ship, Peter Max, the icon of 1960s psychedelic art, caught my eye and memory. I purchased one of his works for $7,000 and eventually placed it in my newly refinished room, with minimal furniture and lots of wall space. That may have inspired my budding interest in art but I was not about to fill the walls of the room all with pieces at that price. What did you have in mind for your art room? My intention was to cover the walls end-to-end with artworks, although the financials made this near impossible. It so happened that just at this perfect moment I noticed an article in Crain’s New York Magazine describing UGallery as a new company that sells artworks online at reasonable prices from emerging artists. The collecting genes in my DNA kicked in again. I enthusiastically researched all of UGallery’s artists and their artworks and loved the concept and convenience of buying online with return privileges, shipping and the ability to communicate directly with the artist. So, on December 12, 2014 I purchased my first UGallery artwork. 28 more pieces, from 21 artists, have since followed. I still have much wall space left to fill. Does your collection have a specific theme or focus? My taste has changed somewhat from those early days living in London in the late 1960s. My first foray into art was to collect 19th century English oil paintings that were all perfect recreations of landscapes and seascapes. Almost like photographs. Now over 45 years later my taste has tempered a bit and I have expanded my art genre interest to many areas short of extreme modern art, such as a black canvas with a white dot in the middle [laughs]. 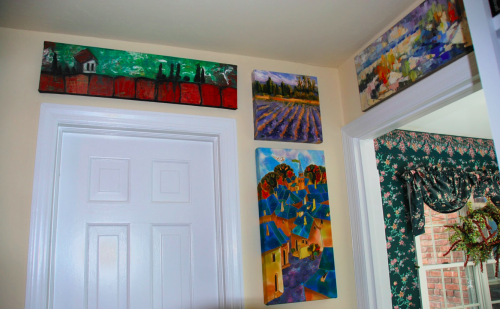 The focus of my artwork is to fill my art room end-to-end with artworks that I like. While I don’t seek out a specific style, diversity is the key. My first concern in purchasing art is that I must like it. But since I am trying to fill a room end-to-end I am also concerned with the size and shape of the art, which is a bit like doing a jigsaw puzzle. I want the room to be an art eyeful when people enter it with little focus on room furnishings. Do you still think about the investment potential when you purchase art? I am no longer interested in the investing aspects of collectibles but simply buy what I like. That takes away a lot of anxiety and leaves me free to just enjoy what I see. I do have a large flat screen wall television in the room with a nice recliner with which to view my growing collection almost every evening. Do you have a favorite piece that you purchased from UGallery? 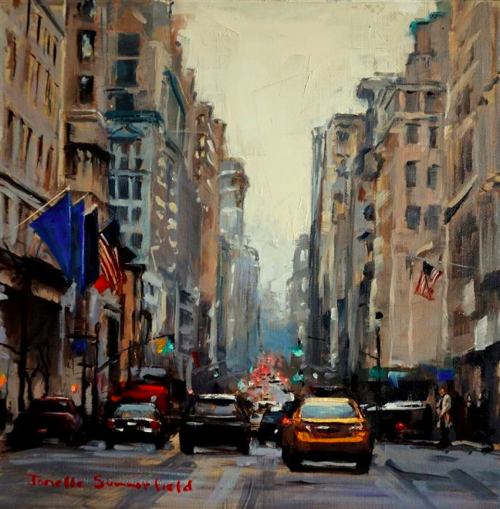 Yes my favorite piece(s) on UGallery are the 12” x 12” works by Jonelle Summerfield that depict Manhattan street scenes. These seem to be grabbed up as soon as they are drying. I have managed to get four by checking in just about every day to see if she has finished new ones. What advice would you give to a beginner art collector? Starting as a true late stage novice in the art world, I owe my growing knowledge to UGallery. I have received a great deal of genuine and insightful assistance from Samantha Greene, the art advisor, and Alex Farkas, the gallery director. They have been patient with me and answer every question I have, however simplistic they may be. Many of the artists that I buy from even send me personal notes. The advice I can offer as a lifelong collector of so many things, is to buy only what you really like and don’t look at what you collect as purely an investment. If a piece someday becomes worth more, so much the better, but enjoy it now. Also learn as much as you can about what you collect and ask those who know for help – in my case, UGallery. If you’re a UGallery collector and would like to have your collection featured, please drop us a note at marketing@ugallery.com.